Retiring David Wright's No. 5 is a given, but when? Retiring the numbers for Jerry Koosman, Keith Hernandez and Gary Carter also a possibility. 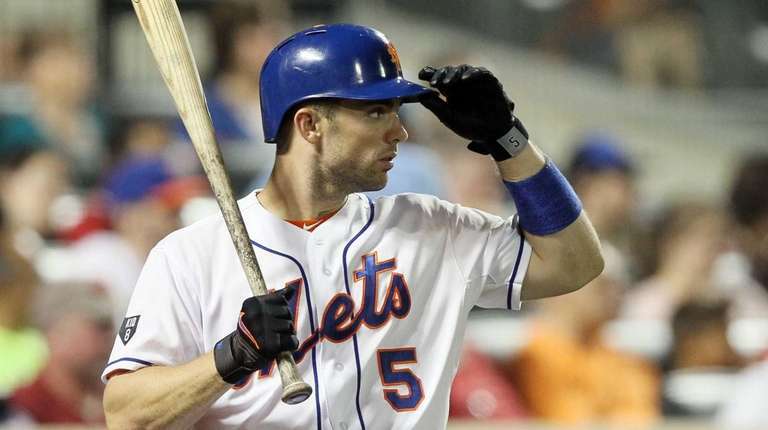 When David Wright trots out to third base at Citi Field at some point during the season’s final weekend, will that be the last time we see the No. 5 on the back of a Met? The presumption is an overwhelming yes, even if Mets chief operating officer Jeff Wilpon refused to rubber-stamp the suggestion during Thursday’s emotional news conference. But given the Mets’ guarded approach toward retiring numbers, Wilpon’s cautious optimism — with Wright sitting beside him — wasn’t entirely unexpected. Put it this way: The Captain shouldn’t have to submit a resume. Wilpon opened Thursday’s proceedings by describing Wright as a “Mets icon” who deserved this last chance to play because of everything he has done for the organization. That goes far beyond his performance numbers-wise, because Wright, as the face of the franchise, essentially was an unflappable Mr. Met during his 14-year career, even when the Flushing world around him was ablaze. “In the clubhouse, we’ve had a really good group of guys for a really long time here, and it’s a huge part due to David’s presence,” said assistant general manager John Ricco, who was involved in the decision-making process to first promote Wright in 2004. “He is the consummate professional, and you talk about working hard. But most importantly, it’s a respect for others and respect for everybody who came in that clubhouse, whether it’s a teammate, member of the media, a front-office employee. There’s an argument to be made that the Mets should just put Wright’s No. 5 on that Citi Field perch alongside the other five (including Jackie Robinson’s No. 42) on this final weekend. But that’s not how the process works, and as Wilpon mentioned, Wright will have to be discussed among the Mets’ Hall of Fame committee, an ad hoc group that in the past has consisted of former players, media members and club officials. Again, there shouldn’t be any speed bumps for Wright, and the only reason to wait likely would be to allow the Mets to pick a date and promote the event for maximum exposure, as every other club does with these matters. It’s worth mentioning, however, that maybe a few others could jump the line ahead of Wright, as Jerry Koosman, Keith Hernandez and Gary Carter are three names that often are brought up in this discussion. When Mike Piazza’s No. 31 was retired in 2016, it came a week after his Hall of Fame induction — and nine years after he finished his career with the A’s. While it always seemed to be a foregone conclusion that Piazza’s number would hang in Flushing, the Mets still waited for his validation in Cooperstown before preparing a full weekend of festivities to honor him at Citi. As picky as the Mets have been about retiring numbers, the Hall of Fame isn’t a requirement. Piazza, Tom Seaver and Casey Stengel have been enshrined, but the fourth, Gil Hodges, is not in Cooperstown, as much as he may deserve the honor. Unfortunately for Wright, his HOF trajectory ultimately was grounded by his series of injuries, but that didn’t stop him from finishing at or very near the top of every franchise offensive category, including first in hits (1,777), RBIs (970), runs (949) and total bases (2,945). The other missing piece for Wright? Falling short of winning a World Series ring with the Mets, which Seaver and Hodges accomplished — also Koosman, Hernandez and Carter, obviously. Wright had to settle for the 2015 trip to the Fall Classic, a five-game loss to the Royals, and that ill-fated 2006 postseason march that ended in Game 7 of the NLCS. With Wright’s No. 5 now up for consideration and given the lack of any other active candidates on the horizon, maybe the Mets will get a little more lenient about retiring a few more. Across town, the Yankees lead the majors with 22 retired numbers — the No. 8 is listed twice for Yogi Berra and Bill Dickey — but that tends to happen for a franchise that has won 27 world championships. The Mets’ four retired numbers is the same total as the Royals, Brewers and Nationals (Carter’s No. 8 is an Expos legacy). That’s only two more than the Diamondbacks, Mariners, Rays and Blue Jays. Considering that the Mets just appointed longtime PR guru Jay Horwitz to head up the new alumni relations and historian position, adding a few more numbers could be at the top of his agenda, perhaps as part of next year’s 50th anniversary celebration of the 1969 Miracle Mets. As for Wright, a homegrown star who never spent a pitch in another uniform — not counting the WBC’s Team USA, hence the Captain America moniker — it’s only a matter of time. Apparently, umpire Tom Hallion wasn’t content to be made Internet-famous because of his remark in the Terry Collins viral video. He needed the spotlight again Thursday by standing squarely on the plate, essentially blocking the path of Frazier, as the Mets gathered around to celebrate his walk-off homer. Frazier has been no favorite of the umps this season, based on his repeated complaints about their accountability as well as his switcheroo of a kid’s rubber ball for the real thing on his diving “catch” into the stands at Dodger Stadium. But Hallion’s behavior was unacceptable, whatever the reason, and if that was supposed to be some kind of payback against Frazier — as it certainly appears to be — then MLB has to discipline him. Umpires getting into verbal sparring matches with players is one thing, as Laz Diaz did with Bryce Harper in another high-profile incident Friday night in Atlanta. Hallion took it to another level, however, by interfering with a walk-off celebration, one of baseball’s best moments for both the players and, most importantly, fans of the sport. When umpires choose to forget that the game isn’t about them, as Hallion did Thursday, MLB has to step in. To make matters worse, the MLB Umpires Association even tweeted “Good job, Tom!” after he played chicken with the oncoming Frazier, who couldn’t avoid briefly bumping Hallion as he squeezed past the stubborn ump to celebrate with his waiting teammates. Unacceptable is what it was, and at the very least, MLB will be looking to impress on the umpires that it can’t happen again.